Sometimes, in order to avoid noise and render faster, I set the bounces to 0. The problem is that I don't get any reflection on water, glass, etc. I know that some nodes provide tests to stop a ray (like "is camera ray"). Can I get the best of both worlds: reflection but no noise? I thought of controlling how many bounces a light path makes with nodes or python depending on what kind of materials it hits. Like get +1 bounce if glossy or so. In Render settings → Light Paths → Bounces? We have a global (Total Max, Diffuse/Glossy/Transmission max) control for bounces. 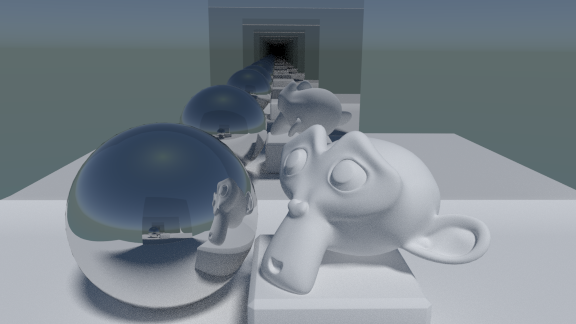 It would be useful to add a ray depth control for shaders. This way, we can specify if a certain shader should only do 2 bounces for example. This can help with performance and noise a bit. Maybe this option could also be added to lamps, so we can set lamps to only do 0 or 1 bounce, and act only as a fill light for example. Where the highlighted value is the number of bounces for this material to be sampled (negative values will not sample it at all, letting rays straight through). As you can see, Suzanne only appears in direct reflections (the pedestals "farther down" are empty). Not the answer you're looking for? Browse other questions tagged cycles materials transparency raytracing or ask your own question. How can I cast artificially darker shadows? What is a shadow ray? Will EEVEE be able to do real time ray tracing?